Synthesizing large proteins, novel nucleotides, or short fragments of DNA is a routine part of doing science today, and a task essential to the pharmaceutical industry. But with the methods of the 1950s, chemically linking together amino acids to form the molecular chain of a protein molecule was a painstaking process limited by the law of diminishing returns. With each addition of an amino acid the new molecule had to be purified by crystallization. The longer the chain, the more difficult it was to crystallize, and the more impurities were present. Bruce Merrifield (1921-2006) devised a simple and ingenious solution to this problem, which he called solid phase peptide synthesis. It earned him a Nobel Prize in 1984. Merrifield's idea was to anchor one end of the lengthening amino acid chain to a solid support made from a polymer. After each step, byproducts of the reaction could be easily washed away. When the molecule was complete, the support was snipped off in a final chemical reaction. Proving the concept took Merrifield three years, and by 1965 he had automated it. Initially he synthesized relatively small molecules, including the nine-amino-acid-long hormone bradykinin, as well as angiotensin and insulin. 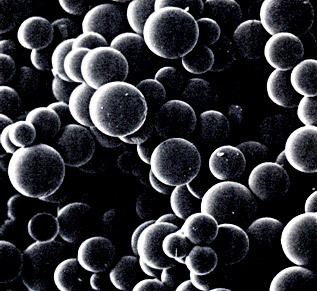 Skeptics doubted, however, that large biologically active molecules could be made with Merrifield's method. He convincingly overcame their doubts with his tour-de-force synthesis in 1969 of the 124 amino-acid-long enzyme ribonuclease A. This heroic accomplishment took 369 chemical reactions and 11,391 steps in the automated peptide synthesis machine. R. Bruce Merrifield received his bachelor's degree and PhD (1949) from the University of California at Los Angeles. He joined The Rockefeller Institute (now University) in 1949 as an assistant in the laboratory of D.W. Woolley and remained at Rockefeller his entire career, becoming John D. Rockefeller professor in 1984. In 1968 Merrifield was a Nobel guest professor at Uppsala University. In addition to the Nobel Prize (1984), he received the Lasker Award (1969), the Gairdner Award (1970), the Intra-Science Award (1970), the American Chemical Society Award for Creative Work in Synthetic Organic Chemistry (1972), the Nichols Medal (1973), the Ralph F. Hirschmann Award in Peptide Chemistry from the American Chemical Society (1990), the Josef Rudinger Award (1990), and the Seaborg Medal (1993). The American Peptide Society offers an annual Merrifield Award for outstanding career achievements in peptide research. 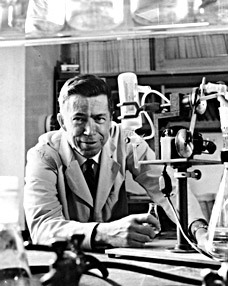 Merrifield was an elected member of the U.S. National Academy of Sciences (1972).